AMD has officially confirmed the specifications of their upcoming Polaris architecture based Radeon RX series graphics cards. The latest slides from AMD show the exact specifications of the Polaris 10 and Polaris 11 GPUs that are deployed inside the Radeon RX 480, Radeon RX 470 and Radeon RX 460 graphics cards which will be available to purchase on 29th June. 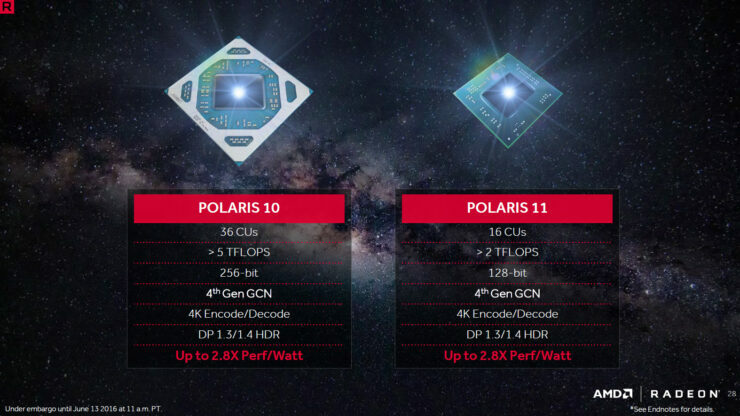 The AMD Polaris 10 and Polaris 11 GPU specifications have been confirmed by AMD. The specifications mentioned are specifically for the full fat Polaris 10 and Polaris 11 GPUs which will be used in the Radeon RX series graphics cards. 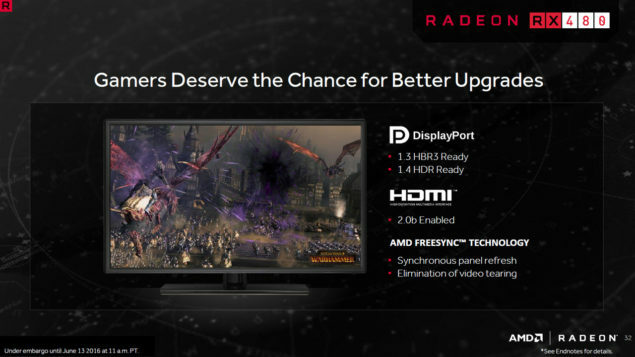 AMD has provided the public with several demos and information of their upcoming lineup but only after Computex have they opened the lid about their Radeon RX series graphics cards which are launching later this month. The Polaris 10 GPU will be the fastest Polaris offering this year and will be featured on the Radeon RX 480 and Radeon RX 470 graphics card. The Polaris 11 GPU will be the smallest of the two chips and will be featured in the Radeon RX 460 graphics card. Polaris architecture is deployed in three brand new Radeon RX graphics cards along with laptop solutions. The AMD Polaris 10 GPU will be used in two cards, the Radeon RX 480 and Radeon RX 470. We had just looked at the first 3DMark performance results of both of these cards but now its time to look at some official details. The AMD Radeon RX 480 features the fourth generation GCN design with 2304 Stream processors on a clock speed of 1266 MHz. The Radeon RX 480 graphics card is capable of delivering up to 5.5 TFLOPs of compute performance which is impressive considering the Radeon R9 390X delivers 400 GFLOPs more while consuming much more power (275W vs 150 W). The Radeon RX 480 is the fastest Polaris GPU from AMD with an impressive 2.8x increase in perf/watt. The AMD Radeon RX 480 will be available in two variants, a 4 GB variant and a 8 GB variant. The starting price for the graphics card is $199 US so we suspect that the 8 GB model will hit retail at a higher price point. The 8 GB memory buffer allows good gaming experience on higher resolutions such as 1440P which this graphics card is designed specifically for. The memory on the Radeon RX 480 graphics card is clocked at 8 GB/s which gives us a total of 256 GB/s bandwidth on the graphics board along a 256-bit wide bus interface. The card comes with a sweet 150W TDP while delivering high performance which is all due to the FinFET node. This allows the card to be powered by a single 6-Pin connector that keeps the card running cool and quiet. The new cooler design is same as the Radeon R9 380 along with some minor updates such as the glossy label while the logo itself is the latest Radeon version that AMD RTG has started using. Display connectors include three DP 1.4 and a single HDMI 2.0 port. The Radeon RX 470 is also based on the Polaris 10 GPU but with cut down specs and a sweeter price point close to $149 US for the 4 GB variant. The card will feature a single 6-Pin connection and TDP of 110W. This card will be best for 1080P gaming as advertised by AMD. AMD Radeon RX 480 Steam VR Performance Test – Faster Than R9 380 But Slower Than GTX 980? 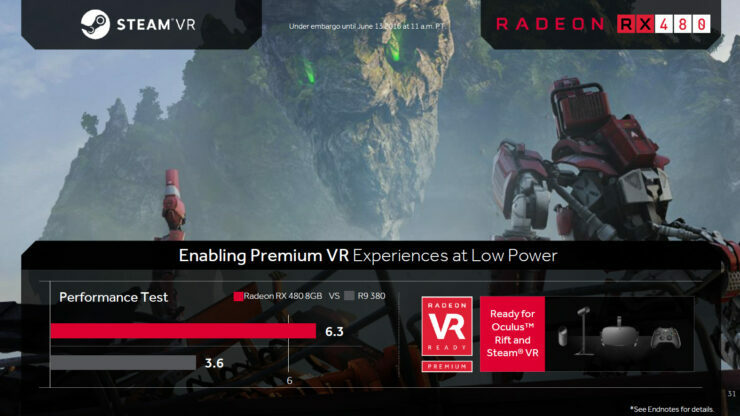 AMD’s official SteamVR performance results show the prowess of the Radeon RX 480 graphics board. 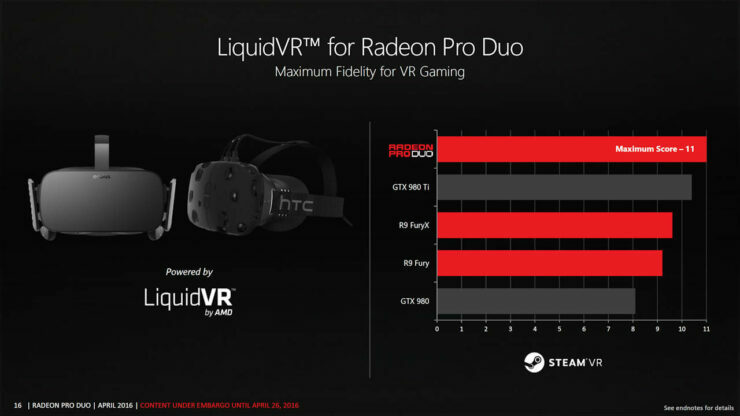 AMD also published results of SteamVR performance test where they compared the Radeon RX 480 against the Radeon R9 380 graphics card. The Radeon RX 480 scores 6.3 points compared to 3.6 points on the Radeon R9 380 which more than 2x increase in VR performance. However, the card doesn’t seem to be as fast as the 980 in VR gaming as AMD’s own chart from a previous presentation shows the GTX 980 scoring more than 8 points in the same benchmark. The GeForce GTX 970 scores 6.5 points according to AMD’s own in-house benchmarking numbers. Of course these graphics cards cannot be compared since they retail at different prices. The RX 480 is a $199 US card ($199+ for 8 GB) while the GTX 970 is $299 US currently. 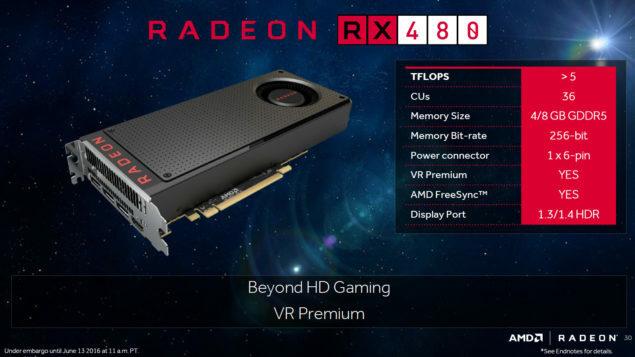 The AMD Polaris 11 GPU will be featured inside the Radeon RX 460 graphics card which is a $100 US product aimed at the esports market where MOBA titles are very popular. The Polaris 11 GPU features 16 CUs which means it has 1024 stream processors. This chip is capable of delivering more than 2 TFLOPs of compute (FP32) performance. The card will be available in 2 GB and 4 GB flavors while sticking to a 128-bit memory interface. Depending on the clock speed used, the card could feature a bandwidth of around 112 GB/s. 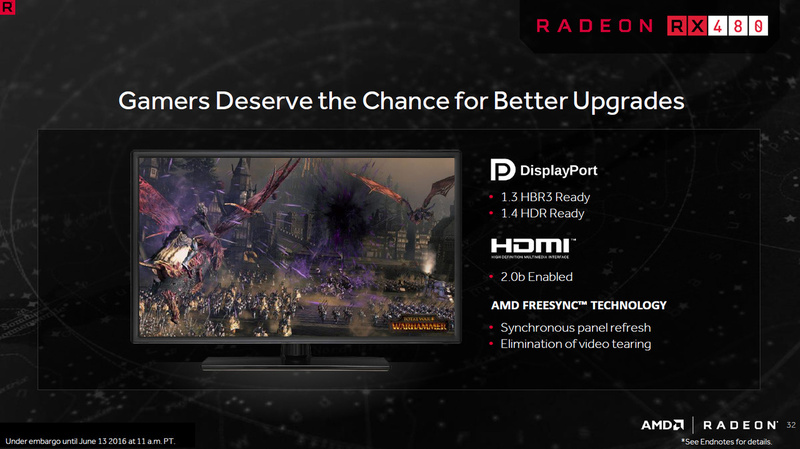 AMD also showed us a glimpse of their Radeon RX 480M laptop GPU in the presentation. 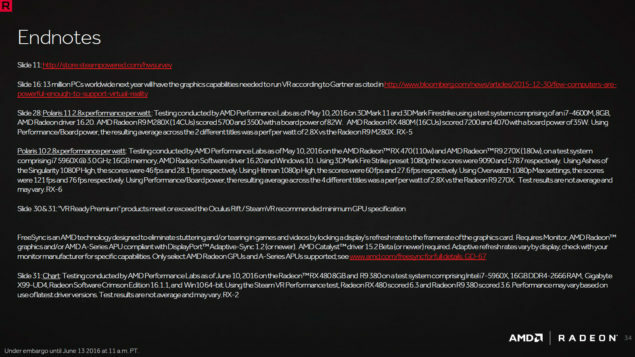 According to the slide shown by AMD, the Radeon RX 480M is a very efficient laptop chip with a rated TDP of just 35W. Benchmarks posted by Tweakers show that the Polaris 11 chip scores 4070 points in 3DMark Firestrike against 3500 points of the Radeon R9 M280 (82W). In 3DMark 11, the RX 480M scores 7200 points against 5700 points on the R9 280M. 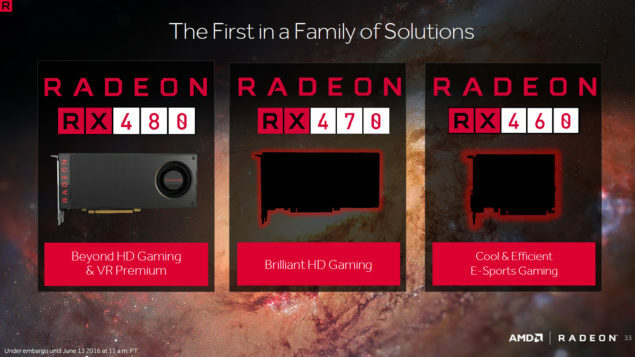 Expect more information in the weeks ahead as we get closer to the launch of AMD’s new Polaris GCN 4.0 based Radeon RX series graphics cards.